The time has finally come for graduation day! 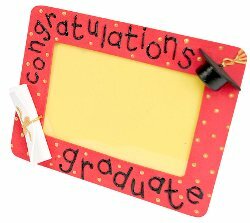 Why not capture this momentous moment in a snapshot and place in this easy to make graduation frame. It makes for a great gift! Preparation: Remove any stickers or tags from surface before beginning. Use Black to paint marshmallow piece; let dry. From corner of black craft foam sheet, measure 1 1/4" on each side edge and mark with pencil dot. Cut between marks for triangular piece for top of cap. Cut 2 1/4" x 3" piece of white craft foam for diploma. Refer to photo and roll up short edge of white foam. Glue 1" of center inside loose edge to secure roll. Refer to photo for placement and glue back of diploma, at angle, to lower left of frame. Refer to photo for placement and glue bottom of cap to upper right area of frame. Glue triangle to top of marshmallow with long side against frame. Use Gold Metallic to paint loop and bow on diploma; paint loop and tassel from center of cap triangle toward corner. Let dry. Referring to photo, use Black to paint large dot at top center of cap over tassel loop and paint words on frame. Use Gold Metallic to paint confetti dots in open spaces of frame; let dry.